Civil War espionage, or spying, was easy to do, but hard to stop because a person's loyalty was difficult to assess. Americans spied on Americans; trust was a rare commodity! Most everyone looked and acted alike though they were from different states. Some traders and businessmen had interests north and south prior to the war and were allowed to travel about freely during conflicts. For example, President Lincoln's personal spy, William Alvin Lloyd, was employed by Lincoln throughout the war and yet, had business interests in the south that allowed him to travel about freely. 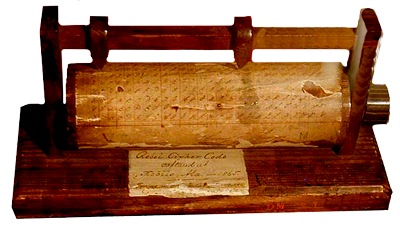 Confederate cipher reel used by war spies, 1863, displayed at the National Cryptologic Museum, Ft. Meade, Maryland. This rare artifact,which was captured in Mobile, Alabama, uses a Vigerere poly-alphabetic substitution, that is a keyword is used to uncover the hidden meaning. There were essentially two types of signal organization: visual signaling with torches, rockets or flags. Flags such as these were used on land or sea to communicate rapidly across a distance—ordinarily that was about six or seven miles. Torches were the only possible communication method at night. Civil War Signal Corps kit, U. S. Army Military History Institute. Neither side had much of a spy organization at the war's onset, but over time Civil War espionage agents became great assets to planning war battle strategy. These pages introduce ordinary people who became extraordinary through their activities, such as child spy Sam Davis; women spies Belle Boyd, Rose Greenhow, Mary Bowser and Sarah Edmonds. 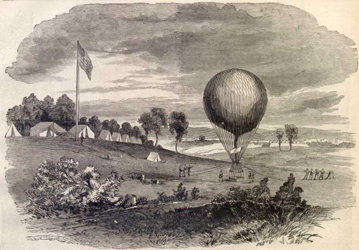 U. S. Civil War women spies played a crucial role gaining important information for commanders developing battlefield strategy. The infamous Allan Pinkerton provided an organization that not only placed spies but sought to uncover spies from the other side.